Objective To provide an overview of the evidence on prevalence and outcomes of incidental imaging findings. Design Umbrella review of systematic reviews. Data sources Searches of MEDLINE, EMBASE up to August 2017; screening of references in included papers. Eligibility criteria Criteria included systematic reviews and meta-analyses of observational studies that gave a prevalence of incidental abnormalities (“incidentalomas”). An incidental imaging finding was defined as an imaging abnormality in a healthy, asymptomatic patient or an imaging abnormality in a symptomatic patient, where the abnormality was not apparently related to the patient’s symptoms. Primary studies that measured the prevalence of incidentalomas in patients with a history of malignancy were also considered in sensitivity analyses. Results 20 systematic reviews (240 primary studies) were identified from 7098 references from the database search. Fifteen systematic reviews provided data to quantify the prevalence of incidentalomas, whereas 18 provided data to quantify the outcomes of incidentalomas (13 provided both). The prevalence of incidentalomas varied substantially between imaging tests; it was less than 5% for chest computed tomography for incidental pulmonary embolism in patients with and without cancer and whole body positron emission tomography (PET) or PET/computed tomography (for patients with and without cancer). Conversely, incidentalomas occurred in more than a third of images in cardiac magnetic resonance imaging (MRI), chest computed tomography (for incidentalomas of thorax, abdomen, spine, or heart), and computed tomography colonoscopy (for extra-colonic incidentalomas). Intermediate rates occurred with MRI of the spine (22%) and brain (22%). The rate of malignancy in incidentalomas varied substantially between organs; the prevalence of malignancy was less than 5% in incidentalomas of the brain, parotid, and adrenal gland. Extra-colonic, prostatic, and colonic incidentalomas were malignant between 10% and 20% of the time, whereas renal, thyroid, and ovarian incidentalomas were malignant around a quarter of the time. Breast incidentalomas had the highest percentage of malignancy (42%, 95% confidence interval 31% to 54%). Many assessments had high between-study heterogeneity (15 of 20 meta-analyses with I2 >50%). Conclusions There is large variability across different imaging techniques both in the prevalence of incidentalomas and in the prevalence of malignancy for specific organs. This umbrella review will aid clinicians and patients weigh up the pros and cons of requesting imaging scans and will help with management decisions after an incidentaloma diagnosis. Our results can underpin the creation of guidelines to assist these decisions. Systematic review registration PROSPERO: CRD42017075679. Incidentalomas are problematic because they can lead to patient anxiety.10 Given the clinical uncertainty surrounding their ideal management, they can encourage further investigations and potentially overtreatment. In response to the risks of incidentalomas, a US Presidential Commission encouraged clinicians to discuss with patients incidentalomas as a risk of imaging before they order a scan.4 Despite this, informed consent before imaging remains poor.11 It is difficult for clinicians to appropriately inform patients of the chance of incidental findings because the data quantifying prevalence is inconsistent and unclear. Clinicians have also expressed uncertainty about the ideal management of incidentalomas, particularly primary care physicians.312 Although some guidelines exist,11314151617 they are often directed at radiologists151617 and for many organs (eg, colon, spine, breast, brain, prostate, and parotid) there are no guidelines to address the management of incidentalomas. Several systematic reviews have been published exploring the prevalence and outcomes of incidentalomas. These studies use inconsistent and often inappropriate synthesis methods, and commonly only focus on one imaging scan or organ. We set out to conduct an umbrella review of all existing systematic reviews, meta-analysing data with appropriate methods and including data for all imaging scans and organs. We aimed to quantify the prevalence with which incidentalomas emerge on any type of imaging test and quantify the outcomes of incidentalomas stratified by organ. We thus hoped to provide both clinicians and policy makers with robust data in an easy-to-access and inclusive format to inform clinical practice and guidelines. The availability of data from diverse imaging modalities and diverse imaging areas and organs in an umbrella review should provide a more comprehensive overview of the available evidence. The protocol for this umbrella review was developed and registered a priori (PROSPERO: CRD42017075679). We conducted an umbrella review of systematic reviews and meta-analyses of observational studies describing the prevalence and outcomes of incidental imaging findings (incidentalomas). Using a structured search strategy (appendix 1), we searched MEDLINE and EMBASE databases up to August 2017. Two authors (TM, SG) independently undertook a three-step parallel review of title, abstract, and full text screens based on a predefined inclusion and exclusion criteria (fig 1). Disagreements were resolved by a third author (JWOS). We included systematic reviews and meta-analyses of observational studies that gave a prevalence of incidental abnormalities (incidentalomas). An incidental imaging finding was defined as an imaging abnormality in a healthy, asymptomatic patient or in a symptomatic patient, where the abnormality was not apparently related to the patient’s symptoms.123 For instance, an adrenal lesion noted in a patient who is undergoing computed tomography of the abdomen after a traumatic accident. Primary studies that measure the detection of incidentalomas in patients with a history of malignancy were included, but only within further sensitivity analyses, because incidentalomas in these patients could often represent metastases (see Sensitivity analyses section below). Study designs beyond systematic reviews and meta-analyses were excluded. Further, systematic reviews and meta-analyses without explicit, systematic literature searches and those that did not inform the prevalence or outcomes of incidentalomas were excluded (as consistent with previous umbrella reviews1819). We also excluded studies that quantified non-imaging incidentalomas (eg, surgical incidentalomas) and conference abstracts (we were unable to complete second level data extraction on conference abstracts). We undertook data extraction on two levels. The first level concerned extraction from included systematic reviews and meta-analyses. The second level included the extraction of data from the primary studies within the included systematic reviews and meta-analyses. For first level extraction, we extracted PubMed ID, lead author’s name, publication year, study population, average age of population, number of studies included, organ of incidental findings, imaging modality, number of imaging studies, number of incidental findings, number of incidental findings with definitive diagnosis, eg, proportion of incidental findings that were ultimately diagnosed as a malignancy (separately for each type of definitive diagnosis). When we found more than one systematic review or meta-analysis quantifying incidentalomas for the same imaging modality and organ, we included the largest and most recent meta-analysis, consistent with previous umbrella reviews.1819 If the most recent meta-analysis was not the largest, we explored this discrepancy and compared the included primary studies of both reviews, identifying the primary studies missing from the most recent systematic review. We then extracted and included the data from these primary studies missing from the most recent systematic review, to be inclusive. For the second level extraction, we extracted from the primary studies within included systematic reviews: lead author’s name, study design, organ of incidentaloma, imaging modality, number of patients undergoing imaging studies, number of patients with identified incidentalomas, number of incidentalomas with definitive diagnosis (separately for each type of definitive diagnosis). One author (JWOS) extracted data, which was checked by a second author (SG). We conducted separate meta-analyses for the percentage of patients undergoing imaging with at least one incidentaloma (prevalence), and the percentage of incidentalomas that were malignant (outcome). We grouped and meta-analysed data by imaging modality and body organ for prevalence of incidentalomas (eg, prevalence of incidentalomas from magnetic resonance imaging (MRI) of the spine). For these analyses, the numerator was the number of patients who had at least one incidentaloma and the denominator was the total number of patients who underwent imaging studies. Thus, we only counted one incidentaloma per patient, which was consistent with most of the primary research. For meta-analyses concerning the rate of malignancy from incidentalomas, we meta-analysed data for each organ and thus the numerator was the number of incidentalomas with a diagnosis of malignancy and the denominator was the total number of incidentalomas. Studies of patients with a history of malignancy were not included in the primary analyses, as incidentalomas in these patients could often represent metastasis, but these studies were included in the sensitivity analysis (see Sensitivity analyses below). Given the substantial variation in methods used by the included systematic reviews to summarise results, we conducted our own meta-analyses of incidentaloma prevalence and malignancy rate. All meta-analyses used a random effects model20 with corresponding 95% confidence intervals. Given that our included data are percentages, we performed double arcsine transformation to stabilise the variance,21 using the inverse variance method.22 For each meta-analysis, along with summary estimates, we estimated several metrics including: heterogeneity with the I2 metric (considered large for values >50% and very large for values of >75%)23 and predictive intervals (to predict the range of prevalence that would be expected in a new study/new population).2425 We also estimated the between-study variance (τ2). We conducted sensitivity analyses including primary studies that measured the prevalence and outcomes of incidental findings in patients with a history of malignancy. Some literature extends its definition of incidentalomas to include patients with a history of malignancy who are asymptomatic or do not have a history of disease in the organ of interest. For example, a thyroid lesion noted incidentally in a patient with a history of colorectal cancer and without symptoms or a history of thyroid disease. Two authors (JWOS, SG) independently assessed each included systematic review and meta-analysis using the Assessing the Methodological Quality of Systematic Reviews (AMSTAR) tool.27 Previous literature has shown that lower sample sizes are associated with a higher prevalence of incidentaloma malignancies.28 To explore this across the included meta-analyses, we used random effects meta-regression to explore whether the estimate of the prevalence was associated with the size of the study (the denominator in the proportion). The meta-regressions were initially weighted by each study’s variance and then adjusted by the random-effects variance in the final model. The amount and consistency of the evidence was judged based on whether the total evidence for each analysis included at least 1000 incidentalomas and whether the heterogeneity I2 was less than 50%. Other criteria used for assessment of credibility in umbrella reviews181929 are not relevant here, given that our assessed data refers to prevalence rather than associations. No patients were involved in the study design or conduct, nor the interpretation of results. We plan on disseminating our results through the patient networks within the University of Oxford and also, funding allowing, gather the thoughts of how our results can help patients make better shared decision regarding imaging and incidental findings. We included 20 systematic reviews from 7098 references identified from our database search (fig 1).7892830313233343536373839404142434445 These 20 systematic reviews included 240 primary studies and 627 073 patients. Fifteen systematic reviews provided data to quantify the prevalence of detecting incidentalomas789283031323334353637383945 (table 1), whereas 18 provided data to quantify the outcomes of incidentalomas789283031323334353839404142434445 (table 2) (13 provided both). We conducted nine meta-analyses quantifying the prevalence of incidentalomas across each individual imaging test (appendix 2). The median number of studies included in meta-analyses was 11 (range 3-93), the median number of participants was 14 409 (557-197 386), and the median number of incidentalomas was 998 (24-4922). Three of our meta-analyses addressed incidentalomas in MRI scans (spine, cardiac, and brain), four for computed tomography (three for chest and one for computed tomography colonoscopy), and two for positron emission tomography (PET) or PET/computed tomography (whole body PET, PET/computed tomography: one meta-analysis excluded patients with cancer and one included patients with cancer). Table 3 reports the meta-analysed percentage of patients with a detected incidentaloma for each imaging test. The percentage was highest in chest computed tomography (45%, 95% confidence interval 36% to 55%), followed by computed tomography colonoscopy (38%, 21% to 57%) and cardiac MRI (34%, 22% to 46%). It was lowest in whole body PET or PET/computed tomography (2%, 1% to 4%) and chest computed tomography for incidental pulmonary embolism (2%, 1% to 4%). Intermediate rates of incidentalomas occurred in MRI of the spine (22%, 19% to 26%) and MRI of the brain (22%, 14% to 31%). We did not identify any eligible systematic reviews or meta-analyses quantifying the prevalence of incidentalomas on any radiography or ultrasonography test. We conducted 11 meta-analyses quantifying the percentage of incidentalomas that were malignant (appendix 3). The median number of primary studies included in meta-analyses was 11 (range 2-36), the median number of incidentalomas was 771 (76-3659), and the median number of malignant incidentalomas was 68 (4-477). Our meta-analyses covered 10 different organs (table 4). Table 4 reports the meta-analysed percentage of incidentalomas that were malignant. Results varied substantially between organs; the highest percentage of malignant incidentalomas occurred in the breast (42%, 95% confidence interval 31% to 54%), followed by the ovary (28%, 11% to 48%). Prostatic (11%, 1% to 28%) and colonic (17%, 12% to 21%) incidentalomas were malignant between 10% and 20% of the time, whereas malignancy in incidentalomas of the brain (0%, 0% to 0.0001%), parotid (5%, 2% to 10%), and adrenal gland (0.0007%, 0% to 0.5%) were rare. Notably, our meta-analyses for colon, parotid, and prostate included patients with cancer because the main analysis (excluding patients with cancer) was not possible as there was only one eligible primary study (colon) or no eligible primary studies (parotid and prostate). We produced two meta-analyses estimating the percentage of thyroid incidentalomas that were malignant: a primary analysis including patients without a history of cancer and a sensitivity analysis including patients with known or suspected cancer. The primary analysis estimated a prevalence of malignancy of 28% (20% to 37%), whereas the sensitivity analysis, with more power, estimated 19% (15% to 24%). We did not conduct meta-analyses for malignancy on data from three systematic reviews83438 because incidentalomas were not stratified by malignancy (either stratified by “urgency level”34 or “significant findings”38) or the diagnosis of incidentalomas was inconsistently or not reported in primary studies.8 One of these systematic reviews quantified the outcome of brain incidentalomas.34 Of 2082 patients with brain incidentalomas, around half (n=1146, 55%) did not require a referral, whereas 815 (39%) were routinely referred for follow-up. For the remaining 121 patients (6%), urgent or semi-urgent referral was required. The second systematic review38 quantified the outcome of incidentalomas of the chest; both the proportion of “significant findings,” which was defined as an abnormality requiring further diagnostic investigation, and the rate of malignancy (but did not state in which organ the malignancies occurred). They reported that 19 (0.6%) incidentalomas noted on chest computed tomography scans were definitively malignant, whereas 917 (28%) incidentalomas required further diagnostic investigation. The remaining systematic review8 also reported that 29 (0.6%) incidentalomas found on cardiac computed tomography were malignant without specifying the organs involved. Six systematic reviews report the non-malignancy outcomes of incidentalomas7931394344 (table 2). The outcomes of the incidentalomas noted on MRIs of the spine of children were inconsistently reported, but all reported were non-cancerous, with the majority reported as disc degeneration (n=96, 74%) followed by disc herniation (n=10, 8%). Around 30% (n=227) of pituitary incidentalomas were macroadenomas, whereas brain incidentalomas more broadly were commonly arachnoid cysts (n=100, 5.4%), aneurysms (n=72, 3.9%), or Chiari malformations (n=63, 3.4%). Extra-colonic incidentalomas noted on computed tomography colonoscopy were diagnosed as aortic aneurysms 2.2% (n=22) of the time. Around 12% (n=120) of patients with incidental adrenal lesions had subclinical Cushing’s syndrome, but less than 1% (n=8) had Cushing’s syndrome itself. Lastly, 3.4% (n=73) of colonic incidentalomas were non-cancerous inflammatory lesions. Of the nine meta-analyses estimating the prevalence of incidentalomas across imaging tests, only one had an I2 value lower than 50% (MRI of the spine). After meta-regression, one meta-analysis had an R2 value greater than 50% (whole body PET, PET/computed tomography (including patients without a history of cancer)). Neither of these two meta-analyses had >1000 incidentalomas. Four meta-analyses had more than 1000 incidentalomas (cardiac MRI, chest computed tomography, MRI of the brain, and whole body PET, PET/computed tomography; sensitivity analysis). Sensitivity analyses with up to one outlying study excluded did reduce the I2 values in all meta-analyses with an originally high I2, but none reached lower than 50%. Thus, none of our prevalence meta-analyses met both our predefined thresholds (I2 <50% and >1000 incidentalomas) for consistency and amount of evidence. Of the 11 meta-analyses estimating the proportion of malignant lesions among detected incidentalomas across organs, four had I2 values lower than 50% (adrenal, brain, thyroid, and parotid). After meta-regression, one meta-analysis had an R2 value greater than 50% (ovary), and one further meta-analysis had an R2 of 42% (thyroid (for patients with cancer)). Of these six meta-analyses, two had more than 1000 incidentalomas (adrenal and thyroid (for patients with cancer)). Of the five remaining meta-analyses, a sensitivity analysis excluding an outlying study reduced the I2 value to lower than 50% in one meta-analysis (prostate), although this meta-analysis contained only 771 incidentalomas. Thus, one meta-analysis (adrenal) reached both our predefined thresholds (I2 <50% and >1000 incidentalomas) for consistency and amount of evidence. Appendix 4 shows the AMSTAR assessment for the 20 included systematic reviews. The median AMSTAR score was 5/11 (range 2-10). Notably, systematic reviews consistently failed to report excluded studies (1/20 systematic reviews achieved this) and a prespecified protocol (3/20). We present an umbrella review quantifying the prevalence of incidentalomas stratified by imaging scan and outcomes of incidentalomas stratified by organ. Our results summarise data for six imaging tests and 12 organs. Computed tomography of the chest, computed tomography colonoscopy, and cardiac MRI scans had the highest prevalence of incidentalomas. Breast incidentalomas had the highest rate of malignancy, whereas brain and adrenal incidentalomas had notably low rates of malignancy. Very large heterogeneity (in terms of the I2 metric) was very common in these data. Few meta-analyses had consistent, non-heterogeneous evidence and a large amount of data. Our results provide essential information for two common and important clinical tasks: ordering an imaging test and further management for a patient with an incidental finding. Before clinicians order an imaging test, they should weigh up the benefits and risks. Imaging tests have many risks; there is the risk of radiation exposure from computed tomography and radiography46 and the risk of allergic reactions and nephropathy from the contrast dye used in some computed tomography and MRI scans.4748 With the increasing use and sensitivity of imaging technology, there is also the risk of incidental findings. Incidentalomas can cause patient anxiety10 and can lead to further investigation and treatment, some of which may cause more harm than good. Incidentalomas also have financial consequences; there are costs associated with further patient management, but also the potential change to a patient’s insurance status and premiums.49 Concern surrounding these potential consequences has led to guidance encouraging clinicians to discuss the risk of incidental findings with their patients before they order an imaging test.4 Our results—the quantification of the prevalence of incidental findings from different imaging tests—equips clinicians to appropriately inform patients about the risks of incidentalomas before the ordering of a scan. Our study provides the data for clinicians to quantify the risk of incidentalomas for numerous different imaging tests and thus allow clinicians and patients to weigh up the risks and benefits of undergoing an imaging test. Our results also equip clinicians to make evidence based decisions regarding the management of patients with incidentalomas. Clinicians who routinely request images have expressed uncertainty regarding further investigations and/or treatment of incidentalomas.12 Clinicians, particularly primary care physicians, are unsure which incidentalomas require urgent further investigation, nor are they sure which incidentalomas are likely to be benign.12 As such, there have been calls for “more research to investigate potential outcomes (of incidentalomas).”4 Our study helps meet these calls. For 12 different organs, we provide the prevalence of malignancy from incidentalomas, and list the other, non-malignancy outcomes. These data will reduce uncertainty surrounding clinical management of incidentalomas and thus help clinicians make evidence based management decisions. Our results will also help clinicians adequately inform patients about the likely outcomes from incidental findings. For instance, our results provide clinicians with the data to confidently reassure patients that an adrenal incidentaloma is likely to be benign. Our results similarly equip clinicians to urgently investigate a patient with an incidental finding of the breast. Although our results can equip clinicians and patients to make evidence based decisions regarding the management of incidental findings, clinicians should interpret the available evidence in the context of the individual patient. Lastly, our results can be used to support evidence based guidelines concerning the management of incidental findings. New and updated guidelines can reduce uncertainty in the management of incidental findings internationally. We elaborate on the guideline implications from our results in the Policy makers section below. Healthcare is moving towards a shared decision making model.5051 In this patient centred approach, diagnostic and treatment decisions are made collaboratively between clinician and patient. A major barrier to achieving shared decision making is the difficulty informing patients appropriately of the intricacies and complexity of clinical decisions.52 One solution to duly inform patients is evidence based decision guides.53 Ideally, these guides should inform patients of the chance of an incidental finding from an imaging scan, and might also explain the likely outcomes of different incidentalomas. Our study provides the data to fill these decision guidelines and thus adequately inform patients. This could facilitate a truly shared decision on whether to undergo an imaging scan and help decide the next steps for handling an incidentaloma. Our results are relevant for policy makers in two ways: to inform new guidelines about the management of organ specific incidentalomas, and to update existing guidelines. We report the outcomes of incidentalomas across 12 different organs (table 2), as well as the meta-analysed prevalence of malignancy (table 4). Guidelines exist in the United States and Europe for the management of incidentalomas for five organs (pituitary,1 adrenal,1314 ovary,15 kidney,1754 and thyroid16). Guidelines concerning pituitary and adrenal incidentalomas offer recommendations for clinicians requesting imaging, whereas the remaining three guidelines (ovary,15 renal,1754 and thyroid16) target radiologists and their recommendations assume a level of radiological expertise. It is difficult to compare our results with the three remaining organ guidelines that offer management recommendations based on features that require radiologist interpretation.16175455 Although we acknowledge the necessity of radiologist specific guidelines, our results for these organs (ovary, thyroid, and kidney) could be used to fill an essential gap: guidelines targeted at the requesting physician. Similarly, to our knowledge, no US or European guidelines exist for the management of incidental findings of the spine, breast, brain, colon, prostate, or parotid. Guidelines for these lesions are essential, since requesting physicians often feel uncertain about how to best manage incidental findings.12 Furthermore, the number of imaging scans continues to increase,56 as does the resolution of scan images and the number of slices per scan.11 The umbrella review can offer the underpinning evidence of these guidelines. A major contributor to the observed levels of heterogeneity is different definitions used by radiologists to classify and report the presence of an incidentaloma. Similar to the concept of varying thresholds for defining a test result positive in meta-analyses of diagnostic accuracy, heterogeneity is common when primary study authors use different definitions for “positive,”59 or more specifically in our case, varying thresholds for what constitutes an incidentaloma. Unfortunately, there are no universally accepted definitions or thresholds for what constitutes an incidentaloma.60 Thus, our results mirror the likely situation clinicians face when requesting imaging scans: the same radiologist is unlikely to report all images requested and thus there is likely to be heterogeneity in the reporting of incidentalomas from image to image. Additional factors likely to have contributed to the observed heterogeneity include variation in baseline patient characteristics, imaging protocols, thickness and number of imaging slices, and histological follow-up to confirm or exclude malignancy between primary studies included in meta-analyses. Varying imaging protocols between primary studies was a likely contributor to the high heterogeneity in the chest computed tomography meta-analyses (both the analysis focused on prevalence of pulmonary embolism, and the other focused on any other incidentaloma). For the pulmonary embolism meta-analysis, primary studies used varying slice thickness; from 1.25 mm to 10 mm (the number of slices was also varied between primary studies but was less consistently reported). This was similar for the non-pulmonary embolism meta-analysis, where the imaging procedure varied within one of the included systematic reviews.38 Four primary studies used electron beam computed tomography, five multi-slice computed tomography, and two single slice computed tomography (the other included systematic review8 did not provide data to address this). Similar discrepancies in imaging protocols exist for the brain MRI meta-analysis: around half the included studies used high resolution scans, the remaining used low resolution (or not reported). In the computed tomography colonoscopy meta-analysis, three of the included primary studies used contrast (27%), the remaining did not. Lastly, the variable duration and type of follow-up and perusal of incidentalomas by primary study authors also likely contributed to heterogeneity through diagnostic investigative bias. A limitation of the meta-analyses concerning the prevalence of incidentalomas is the possibility of counting more than one incidentaloma per image. Of the 15 systematic reviews contributing to the nine meta-analyses of prevalence, most (n=12, 80%) reported only one incidentaloma counted per patient. Of the remaining three, this was unclear for two systematic reviews,739 but interrogation of primary studies within these systematic reviews revealed that most of the primary studies within these systematic reviews counted only one incidentaloma per patient (71%39 and 100%,7 respectively). The remaining systematic review28 did appear to count more than one incidentaloma per patient. However, this limitation does not affect the results or our conclusions. The systematic review that counted more than one incidentaloma per patient contributed data to the meta-analysis quantifying incidentaloma prevalence in whole body PET scans. Excluding this systematic review’s data from the meta-analysis in question did not substantially change the meta-analysed estimate (2.46%, 95% confidence interval, 1.96% to 3.01%) versus 2.53% (95% confidence interval 2.13% to 2.97%) nor the I2 value (98.8% v 98.9%). Lumbreras and colleagues61 conducted a systematic review and meta-analysis quantifying the “frequency of incidental findings” from imaging tests. They combined data from all imaging modalities (radiography, computed tomography, MRI, etc) and presented their results collectively—they estimated that around 25% of imaging tests return an incidentaloma. We chose to present our results stratified by the specific imaging test (eg, computed tomography scan of the chest) rather than for all imaging tests and modalities together, because we considered it more useful for clinicians and patients when ordering a specific test. Lumbreras and colleagues did not quantify the outcomes of incidentalomas. A further strength of our study includes a sensitivity and detailed search strategy: we screened over 7000 titles and abstracts and included 240 primary studies, compared with the Lumbreras study, which screened 250 and included 44 primary studies. We also performed, as recommended for percentage data, double arcsine transformation to stabilise the variance,21 using the inverse variance method,22 and used a random effects model for our meta-analyses. The review by Lumbreras and colleagues calculated the mean “frequency of incidental findings” without meta-analysis models or double arcsine transformation. Furthermore, we should caution that our umbrella review does not capture data on some of the downstream effects of having an incidentaloma, for example, the number of follow-up scans and treatments used, how necessary these management steps are, and whether patients gain or lose eventually in terms of survival or other major outcomes. Hard clinical endpoints would require randomised trials to assess reliably, and utilisation of services may be also context dependent and vary across healthcare systems. Lastly, as is consistent with umbrella review methodology,18192957 primary studies not captured within our included systematic reviews are not included and we did not assess the quality of primary studies, but trusted the choice of the original systematic reviewers to consider them eligible for inclusion. Our review highlights some clear gaps in the literature. 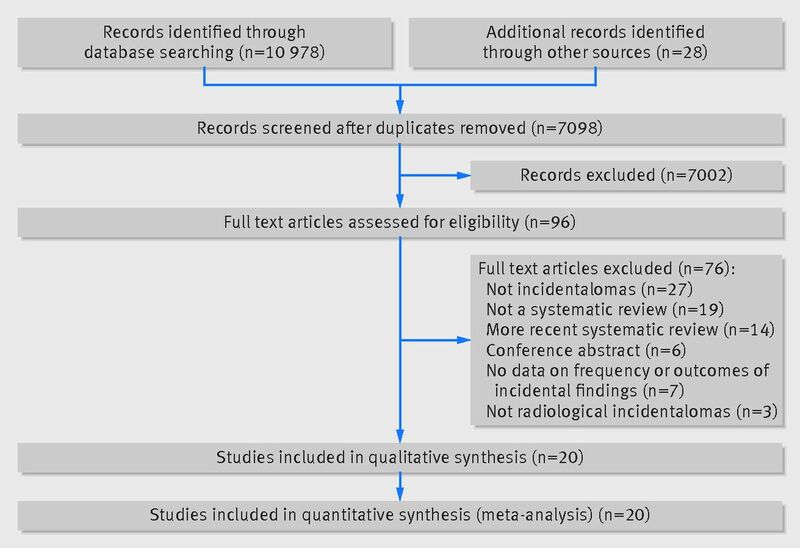 We found no systematic reviews quantifying the prevalence of incidentalomas on any type of radiography (x ray) or ultrasonography. Similarly, future systematic reviews addressing the outcomes of incidentalomas of the liver, pancreas, lungs, and spleen would be advantageous. Further, given the emerging evidence that orthopaedic procedures of degenerative joints are of limited benefit,6263 systematic reviews quantifying the prevalence and outcome of incidentalomas from imaging of the joint (eg, knees, hips, shoulders) would be valuable. Furthermore, guidelines stipulating what constitutes an incidentaloma and what does not, stratified by organ, would be advantageous for clinicians, radiologists, and researchers. Efforts from radiological professional societies to standardise definitions of incidentaloma thresholds, especially for organs where we documented very large heterogeneity, would be useful. Lastly, incidentalomas of the breast and thyroid had the highest rates of malignancy. Cancers of both these organs are known to be commonly overdiagnosed646566 and it is plausible that incidentally diagnosed breast and thyroid cancers might represent (in part) overdiagnosis. Long term follow-up of breast and thyroid cancers diagnosed incidentally would be advantageous to quantify how likely incidentally diagnosed cancers are non-progressive or never grow to cause a patient harm. Data from our comprehensive umbrella review conclude that computed tomography of the chest, computed tomography colonoscopy, and cardiac MRI imaging scans have the highest frequencies of detecting incidentalomas. Of the 10 organs with supporting data, breast, ovarian, and thyroid incidentalomas have the highest rates of malignancy. This umbrella review will help clinicians and patients weigh up the pros and cons of requesting imaging scans, and will assist with management decisions after an incidentaloma diagnosis. Our results can underpin the creation of guidelines to assist clinicians and patients through these decisions. We thank Ben Feakins for his help throughout the study. Contributors: JWOS and JI conceived and designed the study, and interpreted the results. TM, SG, and JWOS screened titles, abstracts, and full texts. JWOS and SG performed the data extraction. JWOS did the statistical analysis and JWOS is the study guarantor. All authors reviewed the manuscript. The corresponding author attests that all listed authors meet authorship criteria and that no others meeting the criteria have been omitted. Funding: This study did not receive any specific funding. The Meta-Research Innovation Center at Stanford (METRICS) has been funded by the Laura and John Arnold Foundation. Data sharing: We extracted data from published systematic reviews, all of which are available and accessible. The manuscript’s guarantor affirms that the manuscript is an honest, accurate, and transparent account of the study being reported; that no important aspects of the study have been omitted; and that any discrepancies from the study as planned (and, if relevant, registered) have been explained.
. Incidental uptake of 18F-fluoro-deoxyglucose in the prostate gland. Nucl Med (Stuttg)2014;53:249-58doi:10.3413/Nukmed-0668-14-05.